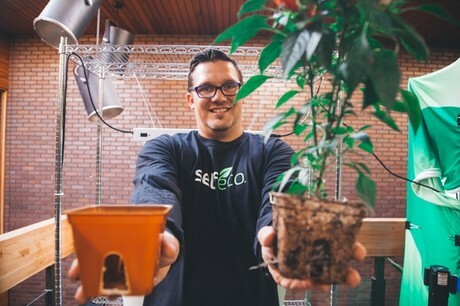 SelfEco's latest product idea was born out of a startling statistic: an estimated 200 million pounds of plastic garden pots end up in landfills each year. So why not reduce that amount by creating the first-ever compostable, self-feeding garden pot? To give its pot a large volume run, SelfEco took to Kickstarter to raise funds. The company put up a $25,000 goal in hopes to purchase a production mold that would improve its capabilities and ultimately shave the retail price of a SelfEco pot by as much as 85 percent. “For right now, we developed a prototype tool just to get products tested,” Danny said. Interest in SelfEco’s product has moved beyond the casual consumer, though. While refusing to disclose specific names, Danny revealed a number of home and garden companies have contacted him to make early orders. 2019-03-13 "Houseplants not that great at cleaning the air"
2019-02-20 "Roses are red, orchids are addictive"
2019-02-01 "A plant a day keeps the doctor away"
2019-01-21 NL: "Growing demand for fragrant orchids"